Sister Ann Ellen Quirk, BVM died Saturday, September 22, 2018 Caritas Center in Dubuque, Iowa. Visitation, Sharing of Memories, Mass of Christian Burial were on Friday, Sept. 28, 2018, in the Marian Hall Chapel. Burial was in the Mount Carmel Cemetery. A Memorial Mass will be held at 11 a.m. on Saturday, October 20, 2018 at St. Rose Catholic Church in Wilmington, Ill. This service will not be streamed. 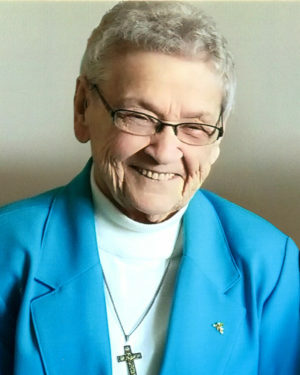 Sister Ann Ellen was a music teacher in Clinton, Iowa; Chicago; Rock Island, Ill.; and Wilmington, Ill., where she also served as pastoral associate and parish minister. She was born in Milwaukee, Wis., on Feb. 8, 1931, to William James and Margaret Mary Roe Quirk. She entered the BVM congregation Sept. 8, 1949, from St. Augustine Parish, Milwaukee. She professed first vows on March 19, 1952, and final vows on July 16, 1957. She was preceded in death by her parents, a sister Catherine (Robert) Kiesl, and brothers William (Grace) and Robert. She is survived by a sister Margaret Quirk, Muskego, Wis.; sister-in-law Marlene Quirk, West Bend, Wis.; nieces; nephews and the Sisters of Charity, BVM, with whom she shared life for 69 years. Dear Sister Ann Ellen was a dear friend of my entire (Fonck) family. We lived across the street from the convent and shared many wonderful times with many of the Sisters. Sister Ann Ellen traveled to Ireland with my parents and shared many of our family milestones. She was my music teacher of which she encouraged me to play the organ at St. Rose. I am still there today volunteering every Sunday. She had a special bond with our “Good News Singers,” of which she implemented many years ago. I can’t begin to tell you the personal impact Sister Ann Ellen had on me. She was always there for everyone. But, the most cherished memory I will have, Sister was my son John’s Godmother. And, a very special Godmother she was. I will never forget Sister Ann Ellen Quirk. I pray for her soul and I know she will continue to watch over us. Rest in peace our Irish angel. Sister Ann Ellen was very special to our parish and family. She taught me and all five of my siblings. She was a strong supporter to my Mother through the many years after our father was killed in a farming accident and left her with six children to continue raising. She provided support to our family during our brother’s losing fight with cancer and our Mother’s death. She started the Kuzma Care Cottage to provide food to the needy of the community no matter what faith they belonged to. Everyone in our community had the highest regard for Sister, She has now received her well deserved reward. Rest In Peace Sister. We would like to offer our sympathies and prayers for Sister’s family and her BVM family. Sister was a blessing to our parish, community and my family. She provided a lot of support to our family through her teaching us in school and her support during the death of our father, mother, and two brothers. We had a special bond with her with the loss of our fathers. She felt bad that she was not able to attend our father’s funeral on October 9, 1959 since that was the day her father passed. We talked about that many times over the years when she visited our home or spoke with us on the phone. Sister was highly regarded by the entire Wilmington Community because of her care for everyone. She will be missed but her legacy will live on through Kuzma Care Cottage. Rest In Peace Sister.